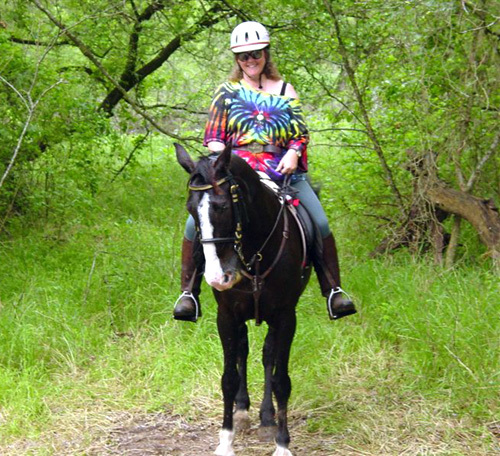 A Happy Horse guest comments on her experience at the park. Hollis & Beaux ride with Megan and Katie a few days after New Year's 2008. View from the handrail on Riverside Trail. 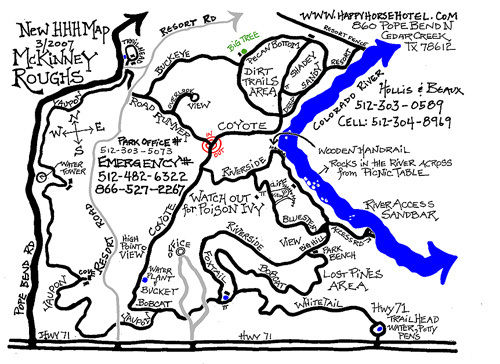 Park horse trail map. Click for printable map. Jack & Diane on the new Pine Canyon trail. Ladies luncheon along the river at the picnic table. Downhill on Bluestem Trail, after the Scenic Overlook. 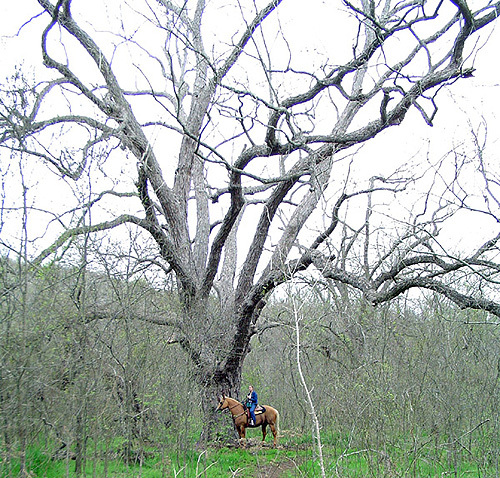 Traci visits the Great Great Grandaddy pecan tree on the Pecan Bottom Trail at McKinney Roughs. Roberta and Jim mount up after lunch under the Grandaddy Pecan. 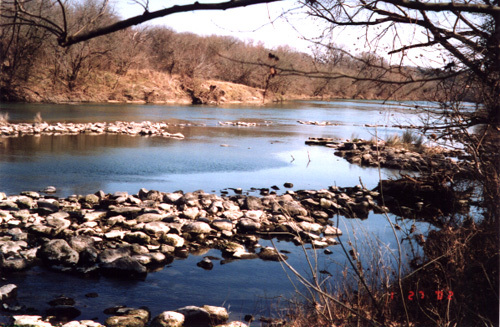 View from Riverside Trail in the winter. Looking down river from Deep Sandy. Trees arch over the trail along the river. Paulette & Larry on the high hill on Coyote Road. Sometimes there's a surprise around the bend! But the crackerjack McKinney Roughs trail maintenance crew cleared Deep Sandy in short order. 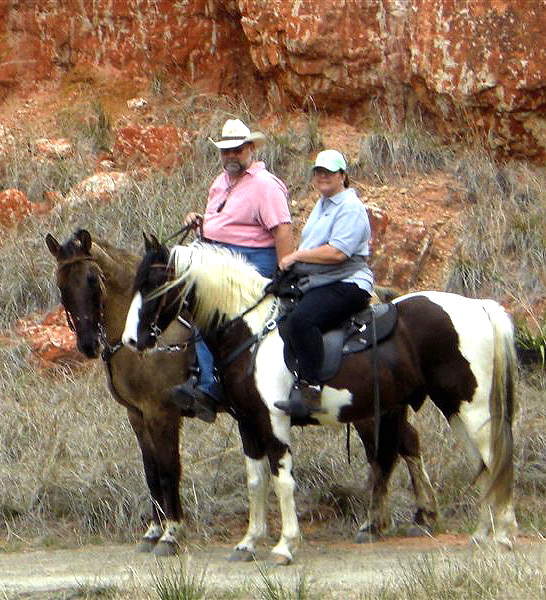 LCRA Trail Crew on patrol - the only motorized vehicles allowed in the park. 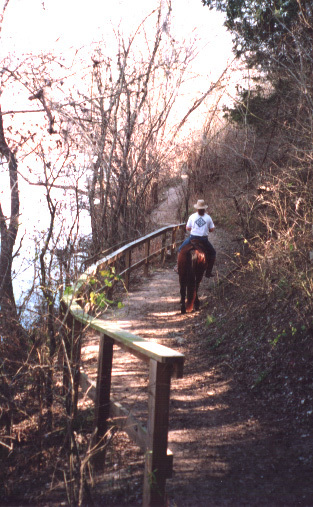 McKinney Roughs Trailhead on Pope Bend Road, 2 miles from Happy Horse Hotel and 1 mile off Highway 71. The Happy Horsemobile is at your service to shuttle you to and from camp. 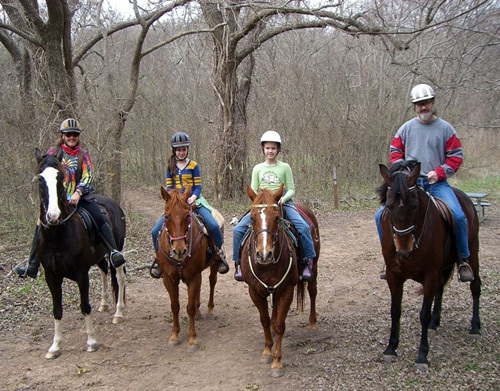 Sidney and her yahoo friends get ready to hit the trails. Hollis Wayne, mistress of Happy Horse, and the Black Max.